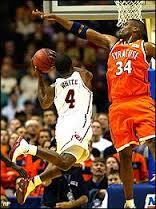 Jeremy McNeil was a terrific shot blocking center for Syracuse, with strong athletic ability. Offensively, he was very limited with his primary shot being the dunk. He knew his limitation on the offense however, and as a result of mostly dunking, had a very high shooting percentage. He was not a good ball handler, and a very poor free throw shooter (fortunately, he had very limited opportunities). McNeil severely injured his knee six games into his freshman season. The NCAA granted him a medical redshirt for that season, and as a result he would have four more years at Syracuse. As a freshman, he became a starter about a third of the way through the season replacing senior Billy Celluck. Despite starting that year, he could only manage 15 minutes of playing time per game as he was constantly hampered by fouls. McNeil would lose his starting job his sophomore season to freshman Craig Forth. While McNeil was more athletic and a better shot blocker, Forth played stronger defense and was a better offensive player. McNeil tended to try go get a block on every opponent's shot, often leaving his defensive position. This put holes in the Syracuse zone defense, created high foul totals for McNeil, and often put him in a position where he could not get the critical rebound. Coach Boeheim would use McNeil as a reserve his last three seasons, in a vital backup role. McNeil would give Forth a rest; more importantly, when Syracuse would shift to a man-on-man or full court press defense, McNeil would often be inserted as the shot blocker, the 'last defense' on the press. In this role he was extremely valuable in the 2003 Championship season.